Where’s all the Conversation at K12 Online Conference? I’m a huge fan of the K12 Online Conference. There’s always a roster of thoughtful educators sharing out engaging ideas and projects, and I always find myself thinking about the possibilities of new ideas after listening to the presentations. One thing I do wish, though, is that more folks would get engaged in the conversations about the presentations. I almost always try to leave a thought or a question on the K12 Online site after watching the presentations, but often, I think I am one of the only ones to do so. It makes me wonder why that is. I’ve even written about this same topic in the past, and I can’t quite figure out why more folks are not using the opportunity to ask presenters more questions or asking for advice on implementation. I am even over at a P2PU Course right now that is using the K12 Online presentations as a launching pad for discussions. There have been a few lively threads, but not too many. I suppose folks are either waiting to watch the presentations (which is one of the benefits of the conference, as it all gets archived and available for the future), don’t have the time to post a comment or question, don’t know what questions they have to ask, or don’t realize that the site is built as a blog, allowing for and encouraging user engagement. I, for one, would love to see more discussions, particularly if the presentations represent shifts in teaching and learning. Karen Fasimapaur’s keynote about encouraging new ways of looking at curriculum development, and opportunities for learning for kids that fall outside the traditional expectations of the classroom. Karen (whom I know via P2PU) offers an insightful look at how we might engage all kids, in project-based learning opportunities. Gail Desler and Natalie Bernasconi give an inside look at a digital citizenship project that is emerging to help teachers help students understand their digital footprints, and how to best manage their identities in a digital world. Really, we all need to be doing much more of this kind of work with our students. Bud Hunt’s talk about making and hacking and playing … spot on! Valerie Burton showed off how to be begin building student digital portfolios online with some free tools that also teach students about information management and design elements. Jane Krauss gives an inside look at the computational search engine Wolfram Alpha, and I am still trying to wrap my head around how I might bring that into our class research projects. I appreciated the time to play around with it, and Jane also shared some resources about using data from the engine to create infographics. Bron Stuckey gave us a tour, with student voices, of the Quest Atlantis site, which is an immersive community for students and built around gaming and inquiry and communty. I’m intrigued but need to learn more. Ben Rimes showed how simple video collection can transform math story problems with real-life examples. All it takes is a cell phone and a good eye towards examples of math in real life. And Matt Needleman’s keynote about apps (It’s not about the Apps) was a great reminder of agency, and how we as users (and our students as users of technology) need to bend devices and technology to our own needs. He talks about photography here, but his larger message is about making shifts from users to creators. I hope you find something to pique your interest at the free conference, all online, and engage in discussions about these great ideas. I’ll see you there. When my 12 year old son finished reading Ungifted by Gordon Korman (Mr. Prolific), two things happened. First, he said “this is the best book I read all summer” and then he asked if he could find a website that calculated his IQ. I let him give it a try, although we talked about the validity of online tools and about why IQ is just one measure of a person. But he was curious because Ungifted (read excerpts) centers around a school for the gifted, and what happens when a “regular student” enters their midst and messes things up, for the better. Donovan Curtis is a troublemaker from the public school, who is always instigating one mess or another, and when one of his impulsive decisions goes completely awry and causes damage to his school, he finds himself unexpectedly and mistakenly in a school for gifted kids, thanks to the bumbling school superintendent. The story quickly becomes a rather predictable tale of the outsider changing the group in a good way while the group changes the outsider in a profound way. I enjoyed Korman’s storytelling, as always, but felt as if he dug up one too many stereotypes of nerdy kids, anxious school superintendents, and other characters that pepper this story. The climax scene, involving a robot named Tin Man Metallica Squarepants (great name!) and a rival robot, Potzilla, is quite amusing and fused with high energy and humor, and Donovan shows some true colors as the story progresses as a friend with a large heart. Maybe that is what my son was talking about. I finally got around to editing and uploading some footage from a keynote address to the Western Massachusetts Writing Project on the topic of digital literacies. I cut the presentation down as far as I could, but it is still sort of long (20 minutes). I hope it helps you frame some ideas around legitimizing the digital literacies of our students. A post I wrote about surveying the reading habits of students ran yesterday at the Nerdy Book Club site. I love being part of that communities of teachers, librarians, and published authors. 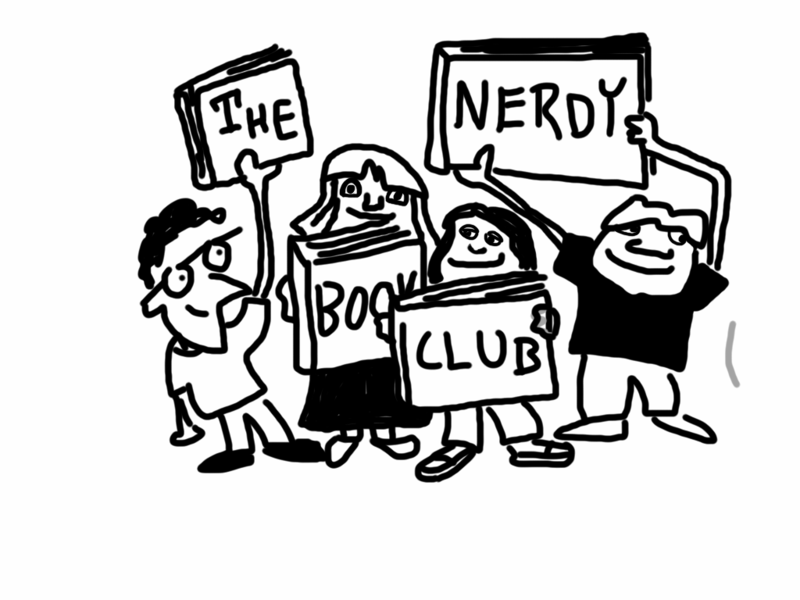 You can be part of the Nerdy Book Club, too. It’s an all-inclusive kind of place. Have you been following the ongoing series of posts at The Atlantic Magazine on the theme of writing? I’ve been back and forth over the past few weeks as the magazine first featured a controversial but very insightful article about a turnaround school that focused its writing curriculum almost solely on expository writing and grammar instruction. This was spurred on by poor test scores and the admission that its students were struggling to write even complete sentences. What the real theme of the series centers around, it seems to me, is the role and balance of creative, narrative writing and expository information writing — which really drives into the heart of the discussion of the Common Core. The first article by Peg Tyre kicked off a series of other posts about the craft of teaching writing with students, and the pieces have been very interesting to read and think about. I take my hat off to Cindy O’Donnell-Allen (a National Writing Project colleague) who argued that teachers need to be writers, and viewed as writers, for students to really take writing seriously as a means of expression. And there have been insightful pieces about the creative process (about developing strategies for ideas) and the need for poetry in the curriculum to nurture logical thinking, and how organizations like Dave Eggers’ Valencia 826 writing centers have energized and supported young writers. And a high school student even responded with a fantastic piece of writing, talking about how some of her best teachers have shown her how to see her own writing through various lenses. And then there are the two technology-related pieces that caught my attention. The first piece talks about how teachers need to start envisioning the assessment and support of student writing with technology as a tool. The notes in the margins to students rarely get read. What if our time was spent more wisely, the authors write, in the early stages of writing, conferring directly with students (or outside of class, with online conferences) and using the technology tools to help with the grammar and syntax. The authors also suggest that the advent of software to read essays might be one of those tools. I’m still not sure about that. The second piece makes interesting connections between traditional writing skills and programmers creating code, and ponders the question of whether software would be less buggy and more innovative if programmers had better writing skills. He notes that documentation of software is often a mess, and that writing focuses a person on logic, and sequence, and clarity. I also appreciated that Tyre came back after those other articles were posted, and responded with another insightful piece, arguing again about the need for balance. Of course, if you look at how The Atlantic frames the series — with the overarching title of Why American Students Can’t Write, you get a sense of rhetorical stance via writing, right? The unspoken answer is that students can write because teachers can’t teach writing. Or don’t. What I have seen in my many years writing about education is that teaching creative writing in place of the mechanics of writing is a disaster for children at the other end of the economic spectrum. Many enter high school unable to write a coherent paragraph. At the tender age of 16 or so, at a time when affluent children are thinking about SAT prep classes and service projects in warm countries, it becomes obvious to some underserved students that they have not acquired the ability to reflect, analyze, and dissect ideas in writing – a set of skills that will enable them to persist through high school English and history and into college. I never did try National Novel Writing Month. Thought about it … but never did it. Now, an offshoot is Digital Writing Month in which folks are encouraged to compose 50,000 words of digital words over the month of November. (Words, I hope, meaning text, image, video and multimedia … and comics). I might try it … or maybe I already do it? In either case, I hope to add some webcomics about the month to the mix every now and then. I’ve written about this a few times, but our inquiry theme this year the Western Massachusetts Writing Project is digital literacies. A keynote address that I gave the other week at a WMWP event centered on valuing the emerging literacies of the digital age. And yesterday, as a follow up to that keynote, I helped facilitate an inquiry session with about a dozen WMWP folks around the idea of valuing student voices. In particular, much of our discussion and exploration centered around the ways that podcasting and audio recording can open up doors for expression for students. We began with a writing prompt, on which we wrote about one of those “aha! moments” around technology — that time when something happened that you suddenly realized some possibilities. We then used Audacity to share out some of our moments. We didn’t save the audio file, however, since it was an experiment in the session and I was working on the school’s computer. But here is a podcast version of what I wrote about, centering on a student with learning disabilities who discovered some tools that helped re-envision himself as a writer. We then spent some time on the National Writing Project’s Digital Is website, considering the rationale and reasons why technology can have an impact on learning, and empowering students. In particularly, we read and watched the videos related to this fantastic resource by some friends in California: The Change Writers. What we really loved is how the resource shows a project that merges the power of digital media and production with writing and research, in a meaningful way. That resource also connected last year’s of WMWP around social justice with this year’s digital literacy theme. Finally, we used Voicethread, too, and we began with a short writing prompt, asking the folks what kind of change they would bring to the world. I’ve kept the thread open, if you want add your ideas, too. Please, do. And for a final reflection, we used Wallwisher to add a final thought to the inquiry session. I was happy to be part of this group, diving into the possibilities of digital literacies and tools, and keeping our focus on student learning as writers and as producers of content.